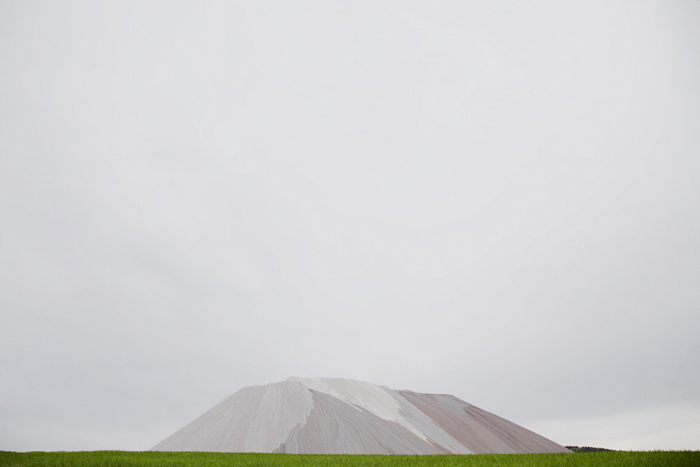 The Kali series depicts a giant potash dump in the middle of Germany, close to where I grew up. I obtained special permission to climb the mountain to take a series of pictures about this artificial landscape. There are still people working on top of the mountain to control the dumping of the potash. The mountain is 540 metres high -- the highest in the area. However, the dump itself is an environmental catastrophe: the soil and nearby lakes are oversalted; you can smell the potash from far away. Wildlife around the mountain has changed a lot during the last 50 years. The nearby river, the Werra, is among the most polluted in Western Europe.